August 10, 2011 (powerhomebiz.com) With the rapid increase in Smartphone and tablet users, service providers are offering a plethora of services to lure new as well as existing users. Wi-Fi hotspots are just one of them. A Wi-Fi hotspot is a dedicated area where customers can use their Smartphones, tablets or other Wi-Fi enabled devices like netbooks or laptops to go online with ease. Though this service is a boon for people on the move wanting to go online, it also gives scammers and hackers an opportunity to exploit the inherent weakness of Wi-Fi security, leaving customer’s personal data extremely vulnerable to hacking attempts. iYogi reviews how customers’ data can be at risk and what they can do to protect it. Connecting to the Internet using Wi-Fi hotspots in railway stations, airports, hotels and cafés while being easy to use can sometimes be exploited by scammers and hackers to get into people’s Smartphones and laptops and steal data. Though the security systems in most phones are capable of detecting external threats like virus attacks, data being hacked while moving in and out of a machine, through a fake gateway is something phones can’t always detect. As these fake gateways set up by hackers act like any authentic gateway to connect to the Internet, it is difficult to detect a fake gateway easily. A Wi-Fi hotspot is an area where one can go online over a local wireless network. These Wi-FI hotspots are created using router or other wireless devices which act as gateways. Common hotspots are coffee shops, airports, train stations, libraries and other public places. As Wi-Fi hotspots free users from cables and hardwire connections they have rapidly become popular with users. But there are reports of stray incidents of users losing their personal information over Wi-Fi networks, which have raised concerns over the security of Wi-Fi hotspots. How are fake Wi-Fi hot-spots created? A hacker can easily create a fake hotspot gateway using a simple mobile Wi-Fi Internet router at any public place like a train station, airport etc. Once the fake Wi-Fi router is connected and ready to work, wireless devices within that area will try connecting to it and to the Internet using it. Once the devices are connected and data is transferred, the hackers can easily view and access all communication and data transfer made from all devices using the gateway. Keeping a tab on the browsing habits of users is just a click away. At times users have to pay for the Wi-Fi service for which they need to fill in a form and enter their personal information along with financial data eg. credit card or bank account number. In such cases, the hacker keeps a tab on this information and uses it later. In this entire operation Wi-Fi users are totally unaware that their personal and financial information are being compromised. Is there a way to check whether a Wi-Fi hotspot is genuine? Technically there’s no way to check whether a Wi-Fi hotspot is fake or genuine. Few service providers are now trying to secure their hotspot services but are still a long way away from making them totally secure. Others are advising their users to take preventive measures like using VeriSign keys that allow users to be certain that their financial information is secure and safe. Checking the authenticity of the websites being browsed is something one should also try and do. But lack of tougher security measures and effective safeguards , Wi-Fi hotspot users remain vulnerable to data theft and hacking attempts on their devices. What can be done to safeguard one’s data? While using a Wi-Fi device make sure that the network is secured with Wi-Fi protected protocols, and access keys are set to the right parameter. These setting options change across platforms like Android, Windows, Mac and iOS device. One can refer to a manual or manufacturers’ website for Wi-Fi security setting instructions. It’s always advisable to disable the Wi-Fi option when a device is not in use. This limits the chances of someone sneaking into a system undetected. While using Wi-Fi hotspots, if possible try accessing e-mails through corporate mail services like Microsoft Exchange servers, Lotus Notes or other e-mail clients as these are far more secure and safe. For those who don’t have access to corporate e-mails; Gmail, Hotmail, AOL or Yahoo Mail are fairly safe bets if secure sockets layer (SSL) protection is enabled on the browser. The SSL can be activated from security page. The security page can be accessed from the Internet options menu on the browser homepage. Before entering financial information online check whether a webpage is secure or not. Websites with an ”https” prefix is considered to be secure and encrypted. Chances of losing data through these sites are minimal. So, next time before entering any personal information while surfing the Web at a Wi-Fi hotspot, make sure that there is an https extension before the web address. Users can always encrypt their saved data be it on a phone or a computer. Encrypting data can help secure information to a large extent. As the entire data stored in the computer is encrypted, it will be extremely difficult for anyone to access the information. The simplest option to protect data is to lock the device when not in use. As it is almost impossible to tell whether a Wi-Fi service or a hotspot is secure or not, taking few important safety measures can go a long way in helping one safeguard data. Service providers are working to get this fixed and it should not be too long before a full proof security solution is found. iYogi is a global on-demand services company that provides personalized computer support for consumers and small businesses in United States, United Kingdom, Canada and Australia. iYogi’s unique model, including proprietary iMantra technology and highly qualified technicians, is designed to eliminate computer-related stress and keep digitally dependent consumers and small businesses protected and productive. iYogi — with its proven global expertise delivery model, intelligent customer insight systems, easy-to-use self-help tools and automated PC optimization and computer support services – offers users a simple yet comprehensive path to digital serenity. iYogi has perfected the remote technical support model to overcome the current limitations of in-store, on-site, or call center services. Major resellers and technology companies are turning to iYogi to improve customer satisfaction, reduce return rates, and deliver a compelling new-value added offering to cus! tomers. 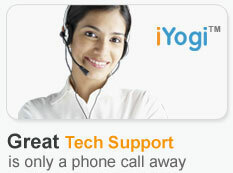 For more information on iYogi and a detailed list of technologies supported, visit: http://www.iyogi.com .